The wives of two jailed opposition mayors in Venezuela have won elections to replace them. The two women, whose husbands were sentenced earlier this year over their failure to contain opposition protests, won by a landslide. Venezuela has been disrupted by mass anti-government protests since early February. Talks between the government and the opposition to resolve the crisis are currently stalled. Patricia Gutierrez won 73% of the vote in the western city of San Cristobal, while Rosa Brandonisio won in the central city of San Diego with 88%. Their husbands, Daniel Ceballos and Vicencio Scarano, were sentenced to 12 and 10 months in prison respectively for their refusal to remove street barricades set up by protesters. San Cristobal and San Diego are opposition strongholds and the women's victory came as no surprise. But analysts say that the wide margin of their win over the governing PSUV party will still be seen as a boost to the opposition. "The result of these elections has shown that power and abuse have received a big lesson," the opposition MUD, for which both women stood, said in a statement. An official for the PSUV party recognised the opposition's win and said that "everyone had to learn from the lesson" voters had taught. The two cities saw some of the worst violence during the unrest, in which 42 people from both sides have been killed. The demonstrations first began in San Cristobal, where students took to the streets demanding an end to high levels of insecurity. They quickly spread to other cities and became a wider movement joined by tens of thousands of Venezuelans disgruntled by high inflation and shortages of basic food items. Talks mediated by the Unasur regional bloc are frozen after the opposition pulled out. The MUD says it will not return until the government releases hundreds of people jailed during the protests. The government accuses the protesters of trying to topple President Nicolas Maduro. 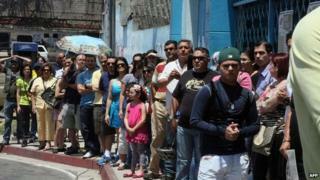 On Sunday, the president warned he would not allow any more unrest in San Cristobal or San Diego. "If they go crazy and start burning the municipality again, the authorities will act... and elections will be called every three months, until there is peace," he said before the election results had been announced.